At Southcoast Health, we offer minimally invasive, varicose vein treatment to close and remove unsightly spider and varicose veins. Our vascular surgeons perform vein ablation, also called endovenous ablation, using radiofrequency (light energy) to close and eliminate your vein problem. Endovenous ablation is a safe, less invasive treatment that leaves virtually no scars. We are also now offering the VenaSeal™ closure system, a new, minimally invasive procedure that treats venous reflux disease using an advanced medical adhesive to close the vein. Patients treated with the VenaSeal™ closure system often have minimal to no bruising and can return quickly to normal activities. In some cases, patients also may not need to use compression stockings after the procedure. If you’d like to learn more about varicose vein removal in RI or MA, call (508) 973-2213 to request an appointment with a vascular surgeon at Southcoast Health. We offer specialized care and treatment at our Southcoast Vein Center in Dartmouth, MA and our outpatient vein clinic in Middletown, RI. Are You a Candidate for Vein Removal? Vein removal is most commonly used to alleviate symptoms of pain and discomfort from varicose veins. Vein removal is also performed for cosmetic reasons. If you have painful symptoms, such as aches, swelling, burning, throbbing, itching, muscle cramping or bleeding, speak with a specialist at Southcoast Health to receive the care you need. 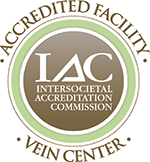 A trained vascular or endovascular surgeon will perform endovenous ablation at one of our vein centers. At Southcoast Health, we offer both thermal and nonthermal ablation. VenaSeal™ is the most cutting edge method of closing symptomatic varicose veins using a non-thermal non-tumescent anesthesia technique. Radiofrequency and endovenous laser treatments (EVLT) are two methods that use thermal energy to close symptomatic varicose veins. These methods will destroy the vein and cause it to fade over time. Once your procedure is complete, you may have to wear compression bandages for several days to control swelling and bleeding if you’ve received thermal ablation. If you underwent treatment using VenaSeal™ there may not be a need to wear any compression stockings. You’ll be able to return home the same day and get back to your normal activities in one or two days. You may need to wear compression stockings for a week or two afterwards, depending on your treatment. Southcoast Health provides noninvasive treatment for varicose veins, including vein removal in Middletown, RI and Dartmouth, MA.